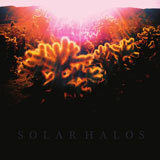 So is Solar Halos from Chapel Hill, North Carolina a supergroup one can wonder. As they consists of guitarist/vocalist Nora Rogers, who has collaborated with mastermind Jenks Miller of Horseback and also been a part of Curtains Of Night along with another collaborator to Horseback handling the drums, John Crouch, who also is involved in Caltrop and last but not least Fin Fang Foom bassist Eddie Sanchez completes the line up. People enjoying Horseback won’t be disappointed as the eerie sound is quite similar. I don’t know what makes a supergroup but super is a word that works well with what I’m hearing when turning on their yet to be released debut album. And as they are a group I’ll just go ahead and call them a supergroup. After a four track demo released back in 2012, they where signed to Devouter Records which in itself is a fitting label and this self-titled debut will be out on January 20th of next year and includes the four demo songs and two new ones. This female fronted stoner rock trio plays it as psychedelic and at times it sounds a bit like post-rock with its originality and progressive melodies and rhythms, but don’t get me wrong this is stoner rock and not some eleven genre hybrid kind of band who sounds as generic as possible as Solar Halos still bring out something new, yet also familiar. Nora Rogers is an astounding singer and she sure has a fitting voice to complete the music they bring forth and a voice worthy to be mentioned again as on this recording, they become another instrument as opposed to when vocals are just what they are, and don’t add anything to the music, but with Solar Halos it blends in perfectly. The guys also get to do some backup singing, but the chanting mesmerising vocals of Nora Rogers are exceptional. One of the newly composed tracks on the album is ‘Tunnels’ and with its up tempo pace and strange rhythms it’s my favorite if I have to choose one which on this debut album sure is hard. The switching from the slightly faster driven stoner rock to more somber like tunes is very attracting and makes Solar Halos very unique in my ears. The album also feels very bluesy overall with their whole sound being blues driven with their heart in heavy rock, almost on the verge of metal, but keeps it’s feet in the rock genre throughout. Having opened for bands such as the almighty Sleep I’m sure and hopeful that we will hear and see more of Solar Halos in the future.